Good news! The Jazz In The Park that I had previously reported on as being cancelled is going to go on as planned. So, if the strike and celebration cancellations have left you hurting for something to do to celebrate Canada Day, the Coxwell parkette will be buzzing with some great music from 5pm onwards. In other news: The annual East York Canada Day celebration would have been 53 this year. Unfortunately, the parade and midway at Stan Wadlow Park are cancelled. In its 53 years of operation, festivities have only been cancelled one other time - in 2002 because of another city workers (read: garbage) strike. I could only go so long without commenting on the strike. I was trying to carry on as usual, however, I've just found out that the Danforth Mosaic BIA Jazz in the Park slated to start tomorrow has unceremoniously had their permit revoked and are now scrambling to find another location to house the big opening event. I will keep everyone posted. Commenting is open on this blog (for now) so keep it clean! In these days of economic hardship, everyone is all about the "staycation" rather than the vacation and what with our 1-day midweek holiday next week, even those who have cottages in Muskoka will most likely be staying close to home. What to do in (or near) our hood on July 1st? If you're around the neighbourhood on your own staycation, then you certainly can't miss the opening act of Jazz In The Park - a new weekly jazz fest coming to the Danforth. Organized by the Danforth Mosaic BIA (yay, BIA! 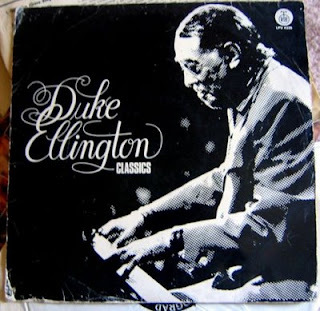 ), Jazz In The Park will happen every Wednesday from 5pm until 8pm at the Coxwell Parkette (the park next to the Green P lot on the south side of Danforth). Opening the series on July 1 is the JUNO nominated group Autorickshaw, an uber-popular jazz quartet that blends jazz, funk and world music. I would say this is going to be a highlight of the season, so you shouldn't miss it. 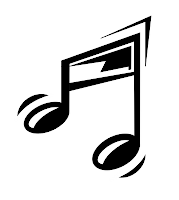 There are 9 other weeks of great musicians lined up but I won't list them all! For all of you who have been asking, I finally have an update on the East Lynn Farmers' Market situation. They will still go ahead as planned, in the park tomorrow afternoon as per usual. Thanks to DECA for keeping me in the loop on this! This morning found many a Danforth resident frowning sadly at the empty civic centre field where there was once a weekly farmers' market. Due to the strike, the market was cancelled leaving many a hostess (me included) scrambling for fresh strawberries and sausage. But fear not, thanks to DECA (Danforth East Community Association) the farmers persevere at the East Lynn market scheduled for Thursday. The market will NOT be at the park, because it is a city property. It will most likely move to a school parking lot or something of the sort. I'm awaiting word as I write this and I will keep everyone posted. All hope is not lost - those of you who were planning on Buffalo meat burgers for Canada Day are safe!! Through a fortuitous meeting last week, I happened to find out that O'Connor Brothers Funeral Parlour located at 1871 Danforth is slated for a demolition in the very near future. Good news for Danforth residents, because it was becoming a bit of an eyesore. I was hoping that they would be building a two story book store or a rep. cinema but alas, another morose building will be erected that will be of little or no use to me. It's on good word that the developers are planning on building a medical building on the site. The clinic will be a Family Health Team building - in government speak that means: a Ministry funded initiative designed to improve patient access to complementary primary care services. My translation is that this means there will be lots of medical services for all. The bad news: There won't be a walk-in clinic. Boohoo! Albany Medical Centre is still the only one within a reasonable distance. The good side of this is that the preliminary architect renderings of the site are gorgeous. The building will be modern and although it will stick out amongst the 1940's era facades, it will be a boost to the "face" of Danforth East. Does anyone else find it funny that a funeral parlour is turning into medical centre??? As I was strolling through the neighbourhood recently, I noticed a strange sight in the window of 2035 Danforth (a block west of Woodbine on the south side). 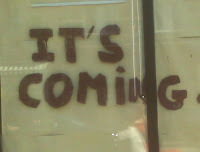 The phrase "It's Coming" is painted onto the window. My first impression, strangely, was that this could be a prophecy for the arrival of a fleet of alien spaceships which will thrust Danforth East into darkness. However, the happy smiley face painted next to it signified that if anything, there will be a baby invasion. All of my sleuthing has come to naught. Not a peep from anyone about this latest mystery storefront. So, if anyone knows what is happening at this address, please let me know. I would love to have an answer to this strange riddle! It dawned on me today, passing by the new Mosaic Beach Studio on Danforth, that making a mosaic item can be a great "green" art project. Saving your old dinnerware and then letting your kids (or yourself) smash them up and making a picture frame or a trivet is a nice way to teach conservation to the little ones.....but don't take my word for it! Tanya Macfarlane, the owner of Mosaic Beach, is the expert on this kind of stuff and will teach you how to do more than just smash up your fine china. This weekend is the grand opening of the studio and there will be contests, cake, punch AND a community art project: the sign for the store hasn't been completed yet, so neighbourhood visitors can come by and glue a few pieces on and contribute to a piece of the Danforth signage - and maybe pick up a few mosaic tips! The studio is at 1374 Danforth Ave. and btw, it looks like we're starting a nice little pocket of art in the east end here. Mosaic Beach joins List gallery, Luc Sculpture studio and S.P.A.C.E. on the strip between Greenwood and Monarch Park! The strawberry: "Doubtless God could have made a better berry, but doubtless God never did." Seriously, what is better or sweeter than a fresh, in-season Ontario strawberry? It's now officially strawberry season here and it couldn't have come any sooner. DECA and the Farmers' Market is inviting everyone to join them at East Lynn park this Thursday for some strawberry festivities and a high-energy concert. Plus, it's their annual neighbourhood potluck in the park. They're welcoming everyone to bring a batch of cookies or a pot of stew, something to eat off of, a hunger for some chitchat with your neighbours and of course, an appetite for fresh Ontario strawberries. Yum! The market runs from 3pm - 7pm. See you there! Summertime, and the livin is easy! Yorkville isn't the only place to see and be seen on a patio. Danforth East can (should) proudly say that this summer is the summer of the patio, with quite a few new additions to the sidewalk space between Greenwood and Woodbine. Firstly, I happened to walk by the Bus Terminal restaurant on the weekend and actually stopped to stare at a sight previously unseen (by me, anyway). The outside space attached to the restaurant was setup as a patio and it was absolutely packed! There wasn't a table to be had on that patio around noon on Saturday with brunchers happily munching away on eggs benny and the requisite chicken souvlaki. I don't remember seeing this last summer (correct me if I'm wrong). The restaurant recently changed owners and I think this was a wise decision by the new proprietors. Patios at Small World Cafe, Melanie's and Blue Nile are all enticing new additions, however, my favourite new patio is the one at Taps & Tales (at Linsmore). Along with a dynamic beer selection, the people watching here is the most interesting. Highschool hoodlums playing hookie, elderly Italians heading for fresh canoli at North Pole Bakery, the Ethiopian contingent and new mom's with babes and puppies strolling along on their way to Jerry's. Whoever said this neighbourhood isn't colourful? It's the canine society event of the season. The place to bark and be barked at. It's Woofstock, the largest outdoor festival for dogs in North America, and its taking over the St. Lawrence Market neighbourhood this weekend. Since Danforth Easters love their dogs, I'm sure many of us will be heading to our favourite pooch salons this week to spruce up our fur babies for the glamourama event- a crew cut and a pedicure included. I usually take the little one to Barkingham Palace (at Linsmore), but I've just discovered a new place that I think is worth a try. It's called Doos For Dogs and it's at the corner of Gledhill and Danforth tucked in behind Relish (2 blks east of Woodbine). This doggy barber shop and spa opened quietly in March, so its relatively new. The owner Sandra has been catering to "little people in fur coats and their humans" for 26 years and finally decided to open her own space. What I liked about it right away is that it's all open concept. The dogs aren't hidden away behind glass or in another room. If you are so inclined, you can hang out and watch your 'precious' get buffed and trimmed right before your eyes! Family Fun Fest is here! It's not until you have kids that you understand this simple fact: Saturday afternoons are no longer about lazy lattes, window shopping on Queen and late night dining. Weekends are all about how to amuse your kids in a space that will let them run around enough to burn their insane amounts of excess energy so that they will fall asleep after bath time without a fuss so that you can have a glass of wine and watch tv. So, that being said, this Saturday afternoon the Danforth Mosaic BIA is holding a Family Fun Fest at the Coxwell parkette (on the southside of Danforth, just west of Coxwell) which will be a great place for your little monsters to run, jump, scream, laugh and get their facepainted. There will be tons of entertainment - dancers from S.P.A.C.E, Harry and His Bucket Full of Dinosaurs and other fun programming. 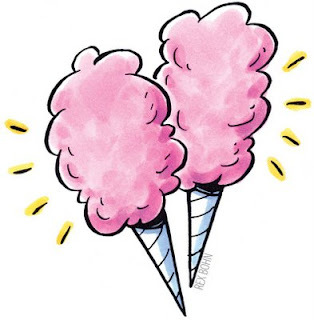 The requisite cotton candy, bouncy castle and clowns with balloon animals will all be there. Festivities start at 11am and go on until 3pm - rain or shine. Here is a link to more info! Extreme Makeover - Danforth Edition! The Danforth East Community Association (and their Facelift team) has been working hard since January to clean up some of the businesses along Danforth. The business revitalization project team has cleaned, swept, painted, nailed, peeled and done just about a million other things that needed to be done on what is now adding up to four storefronts. The most recent facelift was done on a store that many of you have possibly passed by without a second glance - the Universal Diaper store at 1987 Danforth. In a neighbourhood undergoing a serious baby boom, a good baby/kids store is a necessity. Little did I know that inside the store was a great treasure trove of Bummies diapers (of course! ), very cheap kids clothes, sunhats, Swimmies, wooden toys and some of the cutest shoes I've ever seen. DECA helped to clean up the store's front window, clean up the interior and rearrange all their great stuff. It looks great and has created an instant improvement. An added bonus: the cleanup created a new stroller parking area for moms shopping with their babes! I have to get on my soapbox, but only for a moment, I promise: DECA can only do so much to help our hood - they can clean up stores and sweep the trash from the sidewalks, but its up to us (the residents of the neighbourhood) to start frequenting small businesses like this even if we have to pay a tiny bit more than Walmart. Shopping locally is greener, it helps increase the walkability and safety of an area and in the end will make Danforth East an even more desirable place to live, work and shop. Stay tuned: there will be more DECA facelift news in the fall! ....it's time to see the show! How many times as children did you dance through the theme song for The Muppet Show just waiting for the Swedish Chef to throw some meatballs or for Pigs in Space to get lost in planetary orbit once again? Anyone remember "The Muppets Take Manhatten"? Needless to say, the classic songs and jokes from Jim Henson's manic puppet show will live on forever in the minds of a generation. 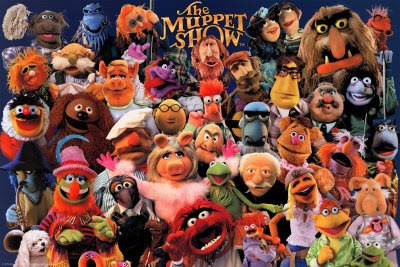 This Saturday, your kids can experience thier own muppet-mania at Kimbourne Park United Church's Muppetravaganza called "The Muppet Show Show" (catchy title, eh?). Seven jazz-influenced musicians will be performing classic music and vintage favourites from “The Muppet Show” and “Sesame Street”. Tickets are a steal at only $10 for adults and kids are FREE! The show is from 3pm - 4pm, Saturday June 6th. You can buy tickets at the door, in advance at the church office or online here. The show is raising money for a really good cause. All the proceeds will go to the “Kits for Kids” project that provides a backpack full of clothing for children aged 0 to 5 going into emergency foster care. The saddest thing is that these children often arrive with nothing, and so this gives them a new set of clothing, pyjamas, a toy and/or a book in a backpack that they can take with them when they move on. A very worthy cause in my mind! Every good Toronto neighbourhood has one or two musical hotspots (don't worry, I won't try and list them) that locals and non-locals alike flock to. Since ours is an 'emerging' neighbourhood, I guess that this is still 'emerging' as well, however, a new unlikely musical venue has caught my eye. Sarah's Cafe & Bar at the corner of Danforth and Monarch Park has just launched a new musical program called 'Acoustic Afternoons' - starting soon - which will feature guest artists playing every Sunday afternoon from 3 until 6. It appears that now their great patio and amazing list of microbrews won't be the only reason to head there on a sunny weekend afternoon! Kitty corner (almost) to Sarah's is Ten Feet Tall, where Sunday afternoons, year round, you can often find many jazz lovers in the area crammed into the wonderfully eclectic space to hear some of Toronto's best jazz artists perform. Many of you probably already know about this, but for those of you that don't it runs from 3:30 until 6:30. Here's the website for more info on the lineup! The long, lazy days of summer seem so far away. This unseasonably cool weather has made me want to just curl up in front of a fireplace and read a book, not think about swimming. However, this past weekend was the official opening date of the City of Toronto splash pads. Woohoo! I'm telling you this because the adult pools and wading pools don't open until the end of June, so if a heat wave was to suddenly strike and your garden sprinkler is just not doing it for you (or you have young children to amuse), Danforth East has two (possibly three) splash pads within its radius. 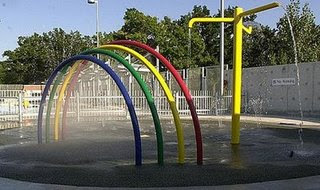 The first is the splash pad at Dieppe Park which is a mega sports park between Greenwood and Coxwell, south of Cosburn. The second is Gledhill Playground which is on Burrell Ave - click here for a map. A third possibility is Cassels Avenue Playground but I haven't been down to that park as of yet so I can't confirm. The splash pads are "open" ie. a wonderland of waterworks from 10 - 8 every day of the week. Happy splashing everyone!